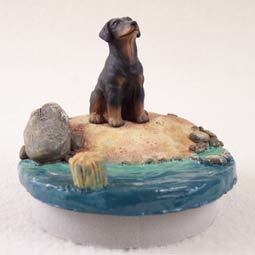 Home > Dogs All > Doberman Blk Uncropped > Doberman Pinscher Black w/Uncropped Ears Candle Topper Tiny One "A Day on the Beach"
The Doberman Pinscher originated in Germany by a man named Louis Doberman of Apolda who designed the breed to be medium size for use as a guard dog and companion. Dobermans are correct with their ears and tails cropped or uncropped. This is a personal preference. In 1976 a white Doberman was whelped that had pure white markings and ice blue eyes. While Dobermans do come in four colors, black and tan, red, blue and fawn, white is not one of the accepted colors. The Doberman has been used as a military dog, and police dog, today’s Doberman is highly intelligent, loving, and an excellent family protector. The AKC recognized the Doberman in 1908 in the Working Group. Average size is 24 to 28 inches tall at the withers.